Sechter was born in Bohemia. He studied in Vienna with his countryman Kozeluh (Kozeluch) and went on to be the music teacher at the Institute for the Blind in Gumpfendorf. In 1824 he was appointed organist to the Hofkapelle. Only later in his life (in 1851) was he appointed to the teaching staff of the Konservatorium where he taught such composers as Vieuxtemps and Bruckner. He took the ground bass theory of Rameau as the starting point of his own theoretical writings. Schubert had wanted to study with Sechter as early as 1824 (a recommendation from Lachner, perhaps?) but had been warned by another friend not to allow himself to be infected by the ‘leathery’ quality of Sechter’s own music. 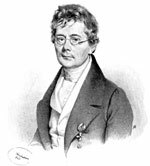 Schubert, together with a fellow composer of his own age, Joseph Lanz, eventually visited Sechter on 4 November 1828 for an hour’s lesson in fugue. This was exactly two weeks before Schubert’s death and there was no opportunity to return, although the composer faithfully sketched the eighteen fugal exercises assigned to him (D965b). There has been much speculation as to why he enrolled with Sechter, including the suggestion that he needed to be seen to undertake this kind of study to be eligible for an official position. It is more likely that he felt attracted to the music of Handel and Bach (like Beethoven at the end of his life), and simply wanted some supervision in the intricacies of counterpoint. The very recently discovered papers of Joseph Lanz may throw new light on this subject.